Long after the game ended Saturday night at Jordan-Hare Stadium the questions remained floating in the crisply cool air. After the last empty popcorn box was thrown away and the lights turned out, people were still wondering: What the heck had just happened? The Texas A&M Aggie offense went through Auburn’s defense like a chainsaw through cream cheese. And it was just as messy as it sounds. Up to this point of the season the Auburn offense has been the unit most responsible for the team’s failure to win games. This weekend the defense took center stage as Johnny Manziel and company rolled up and down the field for 464 yards. Wait for it: In the first half. While we knew this Auburn defense does poorly against spread offenses and we expected A&M to get a lot of yards and points, we did expect some resistance on Auburn’s part at some point. The one portion of the Tigers’ defense that can most positively impact a game is the pair of defensive ends. Unfortunately, Texas A&M’s offensive tackles are both future high NFL draft picks and they completely took the Auburn defenders they faced out of the game. Without Lemonier or any other defensive end getting pressure on the QB, Manziel had all the time in the world to throw. And when he didn’t throw he handed it off to much success, or simply ran it himself. It scarcely mattered which option he chose; in every case Auburn’s tackling was poor. The effort on defense was the worst Auburn has put forth in a game in Jordan-Hare in forty years. Let’s repeat that: the effort on defense was horrendous. Sure, the tackling has been weak this year—though surely better in many cases than last year—but we at least had been able to hang our hat on the notion that the defense was improving; that if we could somehow get the offense to come around, even just a tad, things would be much better. Then came Saturday and the Aggies and… Bang. Bangbangbangbangbang. The crisis has morphed from a lack of offense to a total collapse, just like that. The play of former third-string QB Jonathan Wallace was a plus. Despite the fact that he was playing against the Aggies’ second and third string defense, Wallace looked decisive, a trait that has been sorely lacking from the Auburn quarterback position this season. Wallace made good reads on the fake handoffs to McCalebb, as most defenses are now trained to run outside anytime McCalebb gets close to the ball. Wallace threw the ball better than most people expected. He clearly brought some energy to the offense and he deserves to start. We expect to see Wallace play well and spark the offense this Saturday. But again – it’s New Mexico State. So let’s not draw any grand conclusions. With the promotion of Wallace and the opportunity to play a beatable team (finally!) in NMSU on Saturday, we would love to see this group on offense at least some of the time: Wallace at QB, Prosch at fullback, Mason at tailback, Blake at WR, Uzomah at tight end, and Ricardo Louis at the other end. Do we expect that Auburn will run those players out there all together at the same time? Have you been paying attention this season? No, we do not expect to see them all on the field at once. And it’s killing us. Your intrepid Wishbone columnists have recently branched out from purely print journalism (JOURNALISM?! )* to actually yakking at you via your computer or smartphone-type device. Yes, the Wishbone Podcast now comes at you once a week, featuring Van and John discussing the most recent and upcoming games, the overall situation with the Tigers, what’s going on elsewhere in the SEC and around the country, and more. 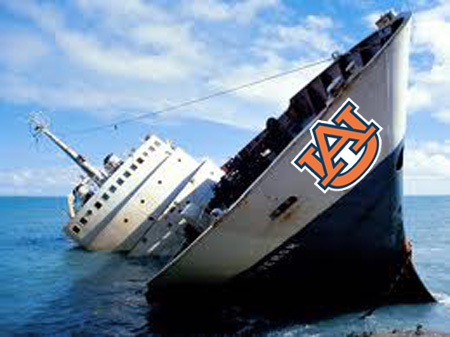 If you were looking for a semi-competent but definitely fun weekly show about Auburn football—and let’s face it, “semi-competent but fun” is probably the best you can ask from us right now, what with the Tigers program in nuclear meltdown mode—then just come on over to the War Eagle Reader’s Wishbone Podcast page, or search on iTunes for “AU Wishbone,” or go direct to http://auwishbone.podbean.com. All of those should get you taken care of. We’d love to answer your questions or respond to your comments on the air, so send them to us via Twitter—we’re @AUWishbone on there—or you can leave questions and comments for us in the Comments section of our War Eagle Reader pages. When we started our online column here, Auburn was on its way to 14-0 and a national title. Two years later, we’ve started a podcast, in the midst of a 1-7 season. Sometimes you eat the bear, sometimes the bear eats you. And the Aggie eats you. And the Commodore. And so on. The very fact that we have to do a section here called “New Mexico State Game Analysis” should say it all. Yes, for the second Saturday in a row, Auburn faces an “Aggies” team on the gridiron. But—don’t panic! At least, we don’t think we should all panic. Not this time. Not against this team. Why? Because here is something that may surprise you: Based on Jeff Sagarin’s ranking of college football teams, Auburn should be a 21 point favorite over New Mexico State. Shocking, isn’t it, that this 2012 Auburn team should be favored over any college football team? But New Mexico State is that bad. Thank goodness, right? But, seriously—just how bad are they? New Mexico State’s only win is over a team that Sagarin ranks 241 out of 246 (that total includes all the teams in Division I-A and I-AA. And yes, we know they don’t call it that now, but we don’t care because the new names are just dumb.) Against a schedule much weaker than Auburn’s, New Mexico State has gone 1-7 and lost by an average score of 33-21. They aren’t good at anything. 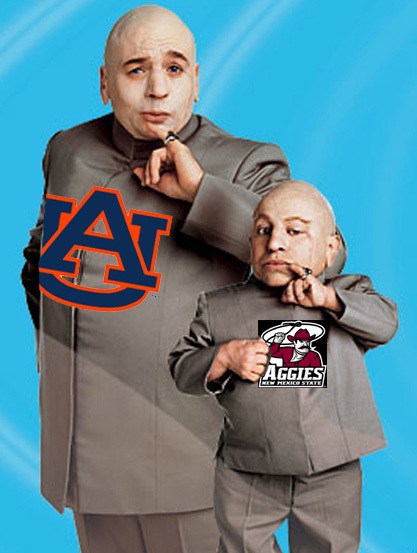 We have finally found a team that Auburn can have some success against: Auburn’s Mini-Me. This brand of Aggie cannot get pressure on the quarterback or make plays in the backfield – that should give Wallace some comfort in the pocket and room to operate. For the first time all season, Auburn’s players should be able to just go out and make plays and have some success. And that will help this team tremendously. And, honestly, at this point—a win is a win, baby. *Shout out to the guys at 790 the Zone, who entertained Van for years with their silly “Journalism? !” exclamations from time to time. Related: The Tragedy of Offensive Coordinator Scot I.
I just want to let you know that… no matter what .. win -lose-new coach- freshmen players -and players that have given up. I am still a die-hard fan. no matter what WDE 4 ever ! John R., if you ever want to grab lunch with a fellow alum (’87) in Richmond. Shoot me an email.